Most of us use websites every day. You’re using a website right now. Facebook, Google, Yahoo, etc are all websites that started somewhere from scratch by someone who had the same idea as you do: “I want to make a website”. While most of us use websites everyday, there is a huge difference between using and creating a website. Hopefully this guide will show you how easy it really is. If you wake up tomorrow and say to yourself “I want to make the next Facebook” then you will be sorely disappointed and bitter towards website development as a whole. It’s important to start small, be realistic, and most of all, be patient with the whole process. There is usually a disconnect among people I talk to and I get a sense of them feeling uncomfortable with the idea of “making a website” because A: They just don’t know where to start, or B: They imagine the process to be incredibly technical/requires tons of coding/very expensive and time consuming. Hopefully this will clear up all those common misconceptions and show you that -yes- it is possible to create a fully functional, beautiful looking website even with no prior web development experience, by simply using the power of WordPress and a few handy tools that you’ll read more about below. I would estimate that it would take a complete beginner around 30 minutes and $60 to create a bare-bones, albeit functional website which they can easily update with a blog, a niche website to make money, or whatever you please. So, let’s get right to it, what exactly do you need? You need a domain name, this is what your visitors will type into the search box or into Google to get to your site. My website domain name is “wiyre.com”, your website domain could be anything you want, as long as it isn’t taken by someone else. As a general rule of thumb, you should aim for a “.com” domain simply because they are the most standard and usually cheap to register. In my case, I took advantage of the free domain from BlueHost when you create a new hosting account, but you can get a domain from any of these companies. You need a hosting provider. These are the people who “host” your website so that people can visit it from anywhere in the world. Imagine a domain name being a door into a room, but without a doorknob, you aren’t going to be able to get anywhere. A hosting provider is the doorknob in this terrible analogy. You need a platform to build your website with. In this situation, we will be using WordPress. Don’t worry if you’ve never even heard of WordPress before, just know that it’s easy to use, easy to update, and most of all easy to modify to your own tastes. Important: If you are going to be building an E-Commerce website where you will be selling products, read this guide instead. Alright. Let’s get started. And remember, above all else, be patient with the process. Try also not to set yourself up for distractions, because while you can always stop at any point while reading this and come back later, it will be much easier for you to setup everything in one full swoop, so you can worry more about the content of your website instead of the nitty gritty setup details. Head over to Namecheap.com. I use them to search for domain names because their interface is simple and easy to use. Type in the domain name you are looking for and it will show you if it’s available and also if the other domain name extensions (like .org, .net, etc) are also available. Keep in mind that you will not be buying a domain from Namecheap, you are simply browsing for one. Write down the name of the available domain name you want, we will refer back to it later. You want a .com domain name. I go into great detail about why this is important in this article, but for the time being, make sure that whatever your domain name is ends with .com. What is the uptime of the hosting services in a yearly timespan? Anything below 95% uptime is a huge amount of time lost where visitors won’t be able to access your website. Cost. It costs money to host a website, so plan accordingly when you go for the best hosting plans available. 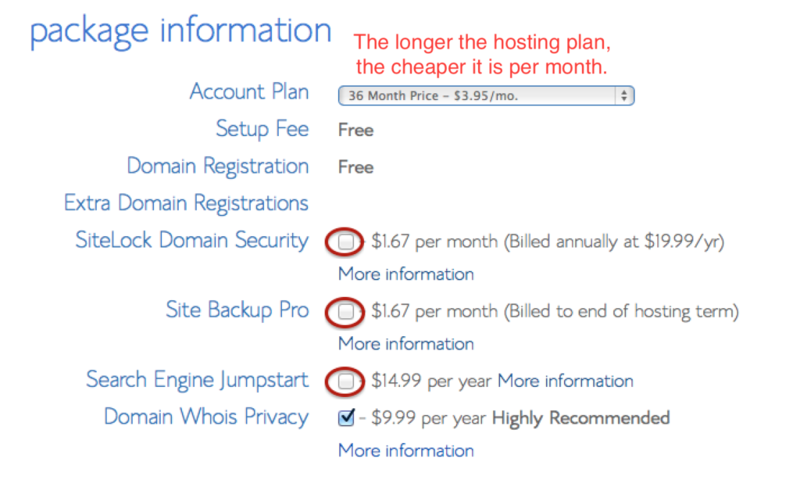 If you read on below there is a screenshot of typical plans offered by a hosting provider. BlueHost is my recommended hosting provider because they give you a free domain name when you sign up even with their most basic plan. Their uptime has been 99.99% for the past year – which is considered excellent in the industry. Even better, you can cancel at any time and they will give you a pro-rated discount for the time that you haven’t used within the first month. The best part about BlueHost is that they offer 24/7 support and service with any website hosting issues you encounter. You could, if you wanted to, call them every day for 365 days straight, and all that service support time would be included in the original price you paid. No hidden costs. You can sign up for Bluehost by clicking on the banner below. * Disclaimer: This is important. If you do decide to take my recommendation and use BlueHost, I want you to know up front that I do make a commission off of every person I refer. This really helps me out so I can write more articles like this. I don’t recommend BlueHost just because they give me a commission, I personally use BlueHost and enjoy them as my hosting provider. I think you will too. If I helped you at all, go ahead and click on the banner above! 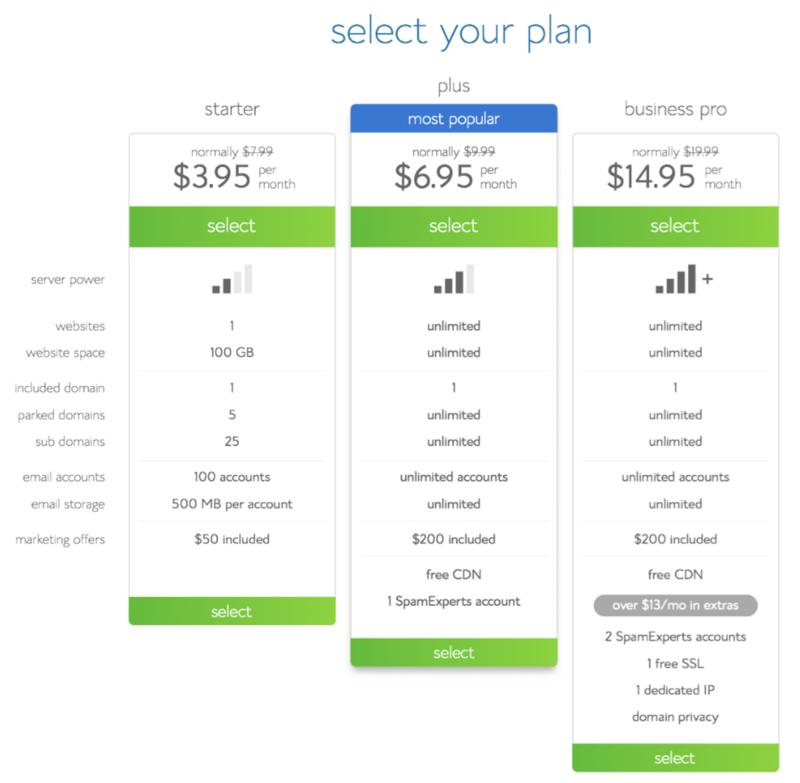 Bluehost has three different pricing tiers that you can choose from. If you are a beginner and are only planning on having one website, the first option is the cheapest and the way to go. Websites is the number of websites you can host on the web hosting plan. Website Space is how much space (usually in GB) that you can store on the web host server. This includes all images/videos/files/etc. 100GB might be filled up quicker than you expect if you have tons of videos or large files being hosted on your website. Keep this number in mind. Bandwidth is the amount of space that can be sent at one time. The cool thing with BlueHost is that it doesn’t matter if one hundred or one million people are on your website at once, BlueHost lets you service all of these people because you have unlimited bandwidth. Included Domains is the number of domains that BlueHost gives you for free. BlueHost will give you a free domain name upon signup and purchase of your hosting account. Let’s not worry about the other options for now. We will go into depth about what they mean during the website setup. For most businesses/individuals, the starter plan with BlueHost will be your best bet. If you need to have an advanced package you can always upgrade later. Alright, we have decided on a domain name and hosting provider, so let’s put it all together. If you decide not to use BlueHost, these instructions may not apply to you – skip to Step 4 instead. BlueHost is a breeze to work with. You don’t know this yet, but it will be so easy to setup WordPress on your account once we have the next few steps finished. Once you click on the BlueHost link above and choose your hosting plan, you’ll be taken to this page. 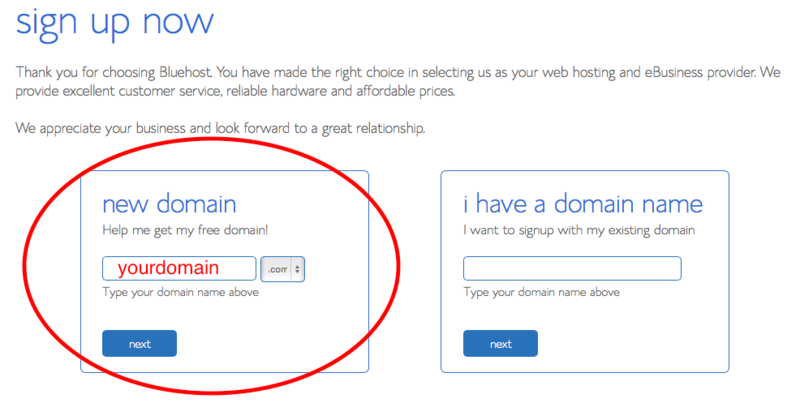 You want to choose the “new domain”, and type in the domain name you chose from Step 1. Once you type in the domain name you want, it will take you to a billing page. The billing page is pretty standard, but there are some extra options which we should talk about just so you know what they mean. The next step is choosing your hosting options. There are a few options to choose here and I’ll explain each one. This is just my recommendation so if you really feel like it’s worth it to spend money for the extra hosting features, go for it. There’s a lot of options on this page – let’s go through it step by step so we know what we’re about to buy. I have all the options unchecked except Domain Privacy Protection. The reason that you may want domain privacy protection is that your email and other identifying information (Full name, address, etc) are published automatically as being the owner of the website. If you don’t care about having your info out there on the web forever, then don’t worry about domain protection. I always get domain protection because I think my basic privacy (even though my name is plastered all over this domain) is worth $0.83 per month. If you don’t care about why I recommend not selecting anything else besides domain privacy, you can skip this part. You don’t need a site backup. 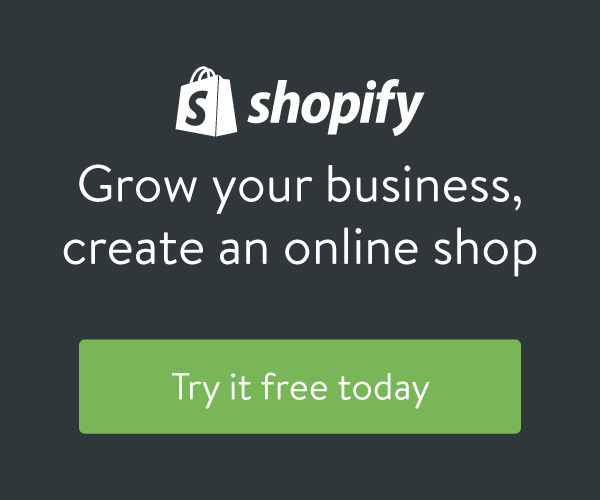 There is a WordPress plugin which will do this for you, even automatically, for free. There is no reason to pay for a backup unless you are not willing to take 10 minutes each month and download the backup to your computer or backup drive. You don’t need SiteLock Domain Security unless you are a business and plan on having their logo on your checkout screen to make customers feel more at ease ordering products or services from you. There are multiple plugins for security for WordPress that can be used for free and some paid plugins that are one-time fees instead of monthly charges. I have found that SiteLock is more a pain than it is a priority. You don’t need a Search Engine Jumpstart. I don’t have experience using Search Engine Jumpstart personally, but I wouldn’t recommend paying money for SEO until you have a fully built website with good content. SEO can come later, and should be the last thing on your mind during the initial setup stage. Lets work on getting the site live first. No longer offered. Google Apps for Work is unnecessary. You can use all the free Google services without having to pay $5 a month. You aren’t missing out on anything by not having Google Apps for work. Once you’ve paid – you’re ready to go. There is one last step to setting up your website. Select the domain name that you want to install the WordPress instance on. You will want to leave the directory blank if you want WordPress across the entire website (recommended). Once you have chosen the domain you want, click on check domain. You should then be given the option to set a custom login name and password if you click on the “Advanced Settings” tab, otherwise, be sure you write down the username and password for your wordpress website. Guess what? You’re done. 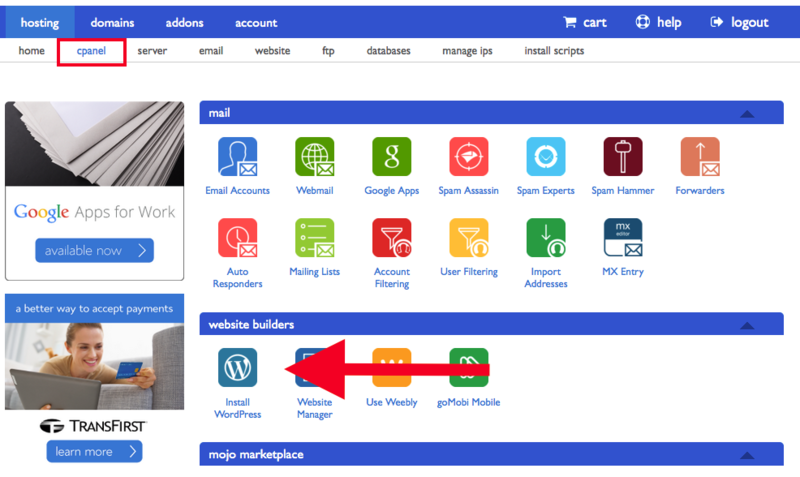 You can now login to your website by going to the WordPress Admin center. You can access that by first going to your website (www.yourdomain.com/wp-admin) and then entering your login information. You can now edit your theme and make blog posts and pages. Congratulations! You’re a website owner! If this post helped you at all, it would really mean a lot to me if you shared it with someone else who could also benefit. Thanks.